Early Reading Development and Dyslexia focuses on how children learn to read and on the difficulties some children have in acquiring this important skill. It concentrates specifically on the very beginning stages of reading development - that is, in the 4-7 year age group. This book begins by considering current ideas about how young children begin to acquire reading skills, and draws particularly on research that focuses on the language abilities that they need to have in place in order to facilitate early reading. The link between phonological abilities and the acquisition of letter knowledge is especially strongly highlighted, but attention is also paid to other reading-related language skills and to the role that parents and teachers play in promoting good early reading development. Later chapters focus on the importance of early identification of reading problems through screening and assessment procedures. Effective teaching of beginning reading skills within the classroom is discussed, prior to a review of current specialist teaching methods designed to improve reading progress in early-diagnosed young dyslexic children. 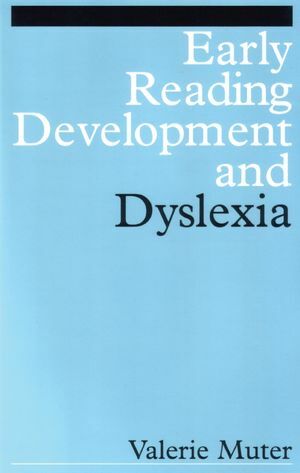 Valerie Muter is the author of Early Reading Development and Dyslexia, published by Wiley. Reading, Verbal Memory and Naming Skills. Phonological Difficulties and reading Failure. Protective Influences and compensatory Strategies. Children at Risk of Dyslexia. Screening for Early Reading Failure. A Model for The Assessment of Reading Impairment in Young Children. Assessing and Teaching The Young Poor Reader. Questions We Still Have to Answer.